Stock your pantry with dehydrated peppers and you’ll be able to add a taste of summer to wholesome, home cooked meals all the year round. Fresh peppers only keep for a few days in your fridge. Dried mixed peppers from Harmony House stay fresh for up to 24 months! Our premium quality dehydrated peppers are picked ripe, washed, seeded, diced and immediately dried. Wholesale dried peppers rehydrate quickly and are virtually indistinguishable from fresh peppers when cooked. Enliven your omelets, salsa, fajitas, soups, chili, stews…any recipe that calls for peppers. Jalapeno dices: available in a variety of sizes and packages, from 1.5 oz. ZIP pouches, to 6 oz. jars, or 22 oz. jugs. Wholesale dried pepper sizes are available in 8 lbs. or 20 lbs. packages. 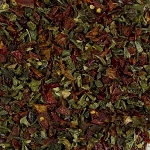 Mixed Dried Bell Peppers: available in 2.25 oz. ZIP pouches, 10 oz. jars, 36 oz. jugs, or 14 or 25 lbs. wholesale boxes. We have done all the work for you in preparing our dehydrated peppers. No more chopping, dicing, or coring. This is particularly helpful for those cooking with arthritis or other conditions that make preparing home cooked meals painful or challenging. Regain your independence by making the meals you love without the chopping chores you can no longer comfortably do. Stock up with dehydrated peppers, dehydrated cabbage, dehydrated celery, dehydrated onion, diced potatoes and other staples for daily cooking. Save money while you save time in the cooking process. Stop buying produce that goes bad in the fridge or paying top dollar for imported peppers out of season. Our dried mixed peppers mean you can use only what you need for each recipe, whenever you need it, for the same affordable price. If you are restocking your emergency supplies, or want to keep a variety of foods on hand in your vacation home, RV, or houseboat, consider getting our Deluxe Sampler. It includes wholesale dried peppers for sale as well as many of our other most popular dehydrated vegetables, beans, legumes and vegetarian TVP products.